It wasn’t always like this. No, it didn’t have to be this way. 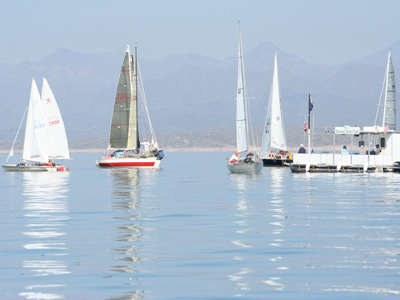 It started so promising, but it turned out to be just another trashy (given the recent rains) windless affair on Lake Pleasant. Don’t get me wrong, I’m not complaining. It was fun while it lasted. Nobody got hurt. We returned to our families. I just wish I could say that lake really blows. The U of A’s lacrosse game against Cal Poly in Tucson (a frustrating 8-7 loss) kept me in town until Hardy and I drove to LP Saturday night. We double-handed Sloop Dogg for the first time on a race weekend with a few tacks and one attempt at setting the whisker pole under our belts before the races started. Executive summary: We had our two best starts of the season. Basic reach out, reach in on starboard tacks both times. 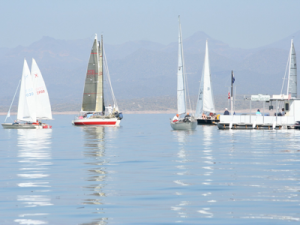 We applied a few of the techniques mentioned in the 2/12/08 “Waste Time Like A Pro” Sailing World online article and in the text for Mike Ferring’s Intro to Sailboat Racing course–Getting Started in Sailboat Racing by Adam Cort and Richard Stearns. During only his third weekend of racing (and 5th time sailing), Hardy improved immensely and handled the genoa trimming and whisker pole setting efficiently and even made sound tactical suggestions. He has become a student of the sport, starting with my copy of Dave Franzel’s “Sailing, The Basics” and augmenting his library with Bob Bond’s book. Our race course management improved even though I made a mental error in each of the two races that turned out to be Velocity Made Bad. There was also the tactical error when I should have borrowed from Bill Gladstone’s article and “wasted time” e.g. slowed down, instead of flopping onto a port tack in front of two overtaking starboard tack boats as we approached the windward mark green tetrahedron above the lay line in the second race. Learning from mistakes is what I do every time I race, except when another weekend comes along, I leave everything behind, and I hope the wind will last.